Lynne began studying reflexology over 25 years ago and went on to train with the International Institute of Reflexology (Original Ingham Method). She has a private practice and runs a reflexology clinic at the 350-resident St Monica Trust care complex in Bristol, where she developed and researched Vertical Reflex Therapy (VRT) in the early to mid-1990s. She also runs a clinic for professional footballers. Lynne frequently presents VRT at international conferences and along with her VRT Appointed Tutors, has taught VRT courses in the UK and internationally to nearly 8,000 qualified reflexologists. 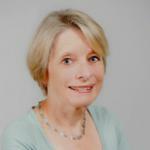 In 1998 Lynne was awarded an ART (Advanced Reflexology Techniques) fellowship for services to reflexology and in 2008, the Association of Reflexologists (AoR) also gave her an Honorary Fellowship. In 2011 the Institute for Complementary and Natural Medicine gave Lynne the prestigious Highly Commended ICNM award for Outstanding Contribution to Complementary Medicine. Her best-selling book, Vertical Reflexology, was published by Piatkus Books in September 2000 and Vertical Reflexology for Hands was published in 2002.